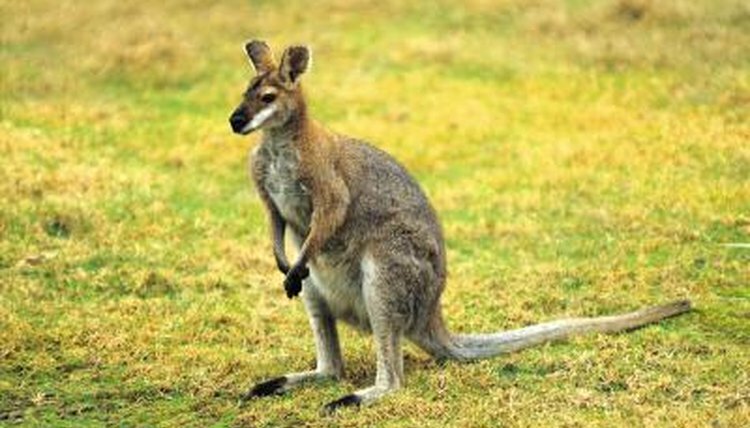 Australia's kangaroos are marsupials, a group of mammals defined by the way its members reproduce. Most mammals bear live offspring that develop internally, within a uterus. Marsupials are also born live, but they are barely past the embryonic state at birth and must complete their maturation in an external pouch that contains teats for the infant to nurse. Kangaroos are related to all other marsupials, albeit to various degrees. The kangaroo's closest relatives are wallabies and wallaroos, which are essentially smaller versions of kangaroos. Together they comprise the genus macropus, one of 11 genera in the taxonomic family macropodidae, which means "big feet" and references one of the universal features of marsupials in this category. Macropodidae encompasses a total of 54 species, nearly all of which get around by hopping on their enlarged hind feet. An exception is the tree kangaroo, a macropod that climbs instead of hops and therefore has bigger forelimbs and smaller hind limbs. Macropods live in Australia, New Guinea and neighboring islands. At the next highest level of classification, kangaroos and its fellow macropods belong to the order diprotodontia, which encompasses 10 families and 117 species found in Australia and its vicinity. Like kangaroos, marsupials in this order are overwhelmingly herbivorous and have two distinguishing features: they are syndactylous, which means the second and third toes of their hind feet are fused together, and diprotodont, meaning they have one pair of incisor teeth on their lower jaws. The kangaroo's diprodont relatives include some of Australia's best known marsupials, such as koalas and wombats, as well as gliders, whose front and hind limbs are attached by a membrane with which they're able to glide on air. Rat kangaroos, possums and cuscuses are also diprotodonts. For kangaroos, the next highest level of kinship correlates with geography. Diprodontotia is one of the five taxonomic orders in the superorder Australidelphia, which encompasses 200 or so species of mammals found in Australia and New Guinea. The sole exception is the monito del monte of Chile and Argentina, which seems to have more in common with kangaroos and other Australiasian marsupials than with any living species in South America. Australidelphian marsupials include carnivorous species such as the Tasmanian devil and marsupial moles which, like other moles, dig underground burrows. Some 90 million years ago, during the Cretaceous period, mammals that give birth to live young -- as opposed to the unusual egg-laying mammal species collectively known as monotremes -- split into what are now considered two taxonomic infraclasses of mammals: marsupials, or metherian, and placentals, or etherian. Kangaroos therefore share a deep evolutionary ancestry with all marsupials, including opposums, of the order didelphimorphia, which are found in the Americas.